XSL Speed Reporter: NASCAR Running E15 in 2011: Is Ethanol Excellent or a Corny Idea? NASCAR Running E15 in 2011: Is Ethanol Excellent or a Corny Idea? While a study commissioned by the FIA motorsports sanctioning body concluded over a year ago that auto racing does not create a significant environmental impact, it was common sense to look into way to set an example for promoting greener technologies. NASCAR is the latest sanctioning body taking a major measure in demonstrating eco-consciousness. Early in the race weekend at Charlotte, NASCAR took the time to inform race team in the close proximity of most of their home bases of an important announcement for 2011. In the upcoming season, Sunoco will be providing the three major touring series of NASCAR (Sprint Cup, Nationwide and the Camping World Truck Series) with a special ethanol-blended racing gasoline. Sunoco Green E15 has been formulated for 2011 racing competition as a mixture of 85% Gasoline/15% corn-based ethanol. Providing details on this new fuel destined to burn within the V-8 engines of purpose-built racing machines, NASCAR and Sunoco have emphasized two major reasons for the adaptation of E15 fuel. Firstly, the major stock car racing body is addressing an environmental move by adapting to a fuel using a percentage of renewable resources. Without doubt, NASCAR's choice to retain basic automotive technology has compelled the thought the environment is of little concern to the sanctioning body. Running leaded gasoline under an EPA auto racing exemption until the 2007 season (leaded fuel had been completely phased out for use United States road vehicles 21 years prior), the usage of V-8 engines which produce the equivalent of between 5-10 miles per gallon doesn't please some groups who believe the activity of auto racing in general is environmentally harmful. The conversion to Sunoco Green E15 race fuel is certain to be one opportunity NASCAR will not rest to promote as their sport gaining modern relevancy. Pertaining to street cars, many production engines and fuel systems in vehicles built after the 1980s have been equipped to accept up to 10 percent of ethanol within a gasoline mixture. As gasoline stations in Canada and the United States are now required to take advantage of this fact, some states are now pushing initiates to bring the ethanol mixture up to 20 percent which may cause trouble for vehicles built before the mid-1990s. The second aspect NASCAR with Sunoco made sure to drive home is that the new racing fuel will be United States-derived. Using corn-drawn ethanol, NASCAR boasts that they're encouraging the optimization of a national farmers in partially ridding dependence on foreign oil. 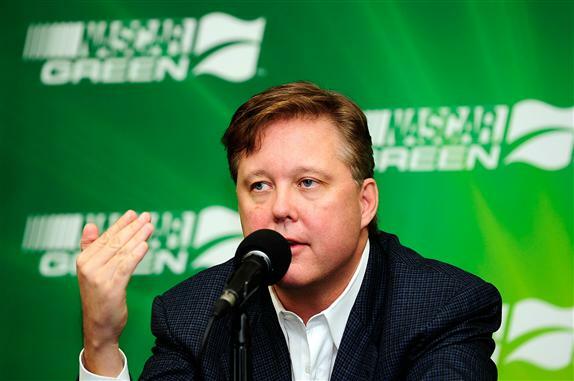 Said to require only nominal costs for race teams of the top-three NASCAR touring series by NASCAR's Green Innovation Managing Director Dr Mike Lynch, he bets on a smooth transition to the new fuel in 2011. "The engine builders have been testing the Sunoco Green E15 for several months, and reports have been very positive. In fact, many have reported they’re actually getting a little more horsepower with the Sunoco Green E15." Dr Lynch said. In fact, one benefit of ethanol-blended gasoline is the process leaves fuel with a natural octane boost. Diverse motorsports fans clearly know NASCAR is not the first North American auto racing series to adopt ethanol or green technologies. The IZOD IndyCar Series had been running a fully ethanol fuel since 2007 (actually containing a trace of gasoline in order to avert alcohol rules until this past season) and the the American Le Mans Series features an increasing number of vehicles exploring E10, E85 and even biodiesel fuels. Announcement of E15 fuel may not be the last word we'll hear from NASCAR changes to the stock cars in 2011. Ears will still remain on NASCAR for official word when fuel injection will be added to either the Sprint Cup and/or the other two touring series. As the 2010 season ends with the winding down of the headlining Chase for the Sprint Cup, NASCAR is starting to score some major points for a healthy future.